Hello PISO FARE friends! Looking for cheap tickets for your trips? 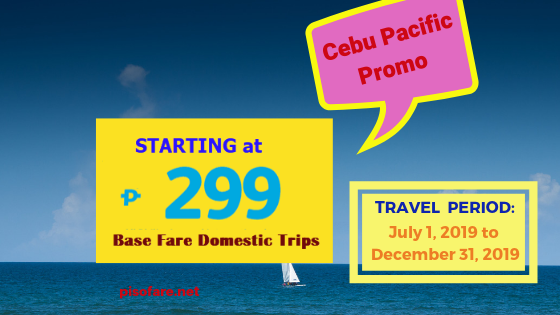 Here are Cebu Pacific promo tickets starting at P299 base fare. on domestic travel. Many destinations on sale from Cebu Pacific hubs in Manila, Cagayan De Oro, Cebu, Clark, Davao or Zamboanga. As for overseas trips, Cebu Pacific promo ticket start at P632 base fare for Manila to Kota Kinabalu flights. Also, on promo are trips to other foreign destinations like Bangkok, Hong Kong, Taipei, Singapore, Australia (Sydney and Melbourne), Dubai and several others. 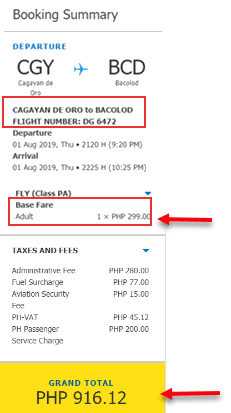 Check sample ticket booking below for Cebu Pacific promo fare Cagayan De Oro to Bacolod/ Bacolod to Cagayan De Oro. Cebu Pacific promo tickets are base fare promos for one-way travel. Excluded in the sale ticket rate are Web Admin Fee, Fuel Surcharge, taxes and Passenger Service Passenger Charge. 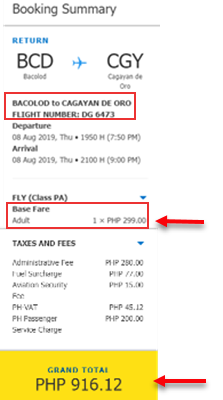 How to Avail Cebu Pacific Promo Fares? Booking ticket online at www.cebupacificair.com. Promo Code not required in booking. Check How to Pay Promo Fares Booked Online by Cash. Another option in getting the Cebu Pacific low fares is by calling Cebu Pacific Reservation Hotline Numbers. You may also visit any Cebu Pacific sales/ticket offices or the airlines accredited travel agencies and booking offices. Save on travel expenses, purchase Prepaid Baggage Allowance during ticket booking or up to 4 hours prior to flight departure. Baggage allowance can be purchased thru the Manage Booking tab on the airline website or thru the reservation hotlines or via their sales offices. You have these baggage allowance options to choose from: 20 kilos, 32 kilos or 40 kilos. Be reminded that a piece of baggage should not be more than 32 kilos. Read Cebu Pacific Baggage Fees: Domestic and International. Want to get the affordable fares of Cebu Pacific? Book or buy the sale tickets now, promo fare availability is limited and may not be available on all flights. Grab the chance to book Cebu Pacific promo ticket and fly to your desired destination from July 2019 until December 2019! Like us in Facebook: PISO FARE TICKET for updates on Cebu Pacific promos and piso fare and Philippine Airlines seat sale 2019 to 2020!